Germany: Day 2 of 2 of the Beer Hall Putsch. The Nazi Party seeks to take over the Bavarian government, but fails and Hitler will serve 9 months in prison where he will write Mein Kampf. CBI - China: Day 53 of 154 of the Japanese Invasion of Manchuria. Spain: Day 116 of 985 of the Spanish Civil War. CBI - China: Day 21 of 29 of the 1st Battle of Suiyuan. Spain: Day 481 of 985 of the Spanish Civil War. CBI - China: Day 126 of 2,987 of the 2nd Sino-Japanese War. Day 89 of 106 of the 2nd Battle of Shanghai. Day 70 of 70 of the Battle of Taiyuan. The Japanese defeat the Chinese. 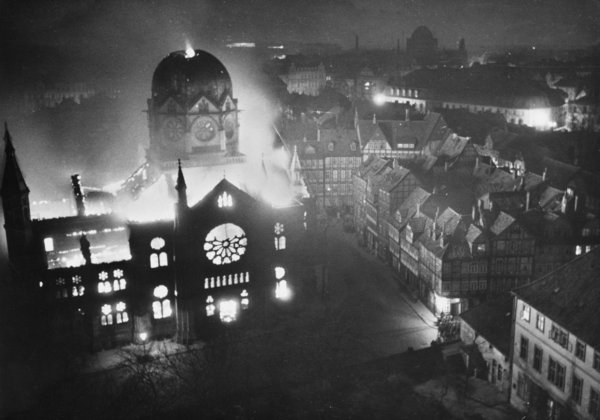 Germany: The infamous Kristallnacht (Night of Broken Glass). 191 synagogues are set afire and more than 7,500 Jewish businesses are looted. 30,000 Jews are rounded up and sent to camps. Kristallnacht, literally "Night of Crystal," is often referred to as the "Night of Broken Glass." The name refers to the wave of violent anti-Jewish pogroms which took place on November 9 and 10, 1938, throughout Germany, annexed Austria, and in areas of the Sudetenland in Czechoslovakia recently occupied by German troops. Instigated primarily by Nazi Party officials and members of the SA (Sturmabteilungen: literally Assault Detachments, but commonly known as Storm Troopers) and Hitler Youth, Kristallnacht owes its name to the shards of shattered glass that lined German streets in the wake of the pogrom - broken glass from the windows of synagogues, homes, and Jewish-owned businesses plundered and destroyed during the violence. In its aftermath, German officials announced that Kristallnacht had erupted as a spontaneous outburst of public sentiment in response to the assassination of Ernst vom Rath, a German embassy official stationed in Paris. Spain: Day 846 of 985 of the Spanish Civil War. CBI - China: Day 491 of 2,987 of the 2nd Sino-Japanese War. Day 29 of 81 of Japan's Operation GUANGDONG. CBI - China: Day 856 of 2,987 of the 2nd Sino-Japanese War. UK: Former Prime Minister Neville Chamberlain dies from bowel cancer at the age of 71. ETO - UK: Day 65 of 258 of the Blitz. East Africa: Day 153 of 537 of Italy's East African campaign in the lands south of Egypt. CBI - China: Day 1,222 of 2,987 of the 2nd Sino-Japanese War. Day 361 of 381 of the Battle of South Guangxi. CBI - Thailand: Day 40 of 221 of the Franco-Thai War (Vichy France vs Thailand). Russian Front - Finland: Day 134 of 142 of Operation SILVER FOX, a joint German-Finnish campaign to capture the Russian port of Murmansk in the Arctic. Russian Front - Finland: Day 132 of 140 of Operation ARCTIC FOX, a joint German-Finnish campaign against Soviet Northern Front defenses at Salla, Finland. Russian Front - Finland: Day 141 of 164 of the Battle of Hanko. The Soviets will be forced off their leased naval base. Russian Front: Day 141 of 167 of Germany's Operation BARBAROSSA. Russian Front - North: Day 63 of 872 of the Siege of Leningrad. German troops advance across the Volkhov river and capture Tikhivin. Russian Front - Center: Day 39 of 98 of the Battle of Moscow. Russian Front - South: Day 11 of 248 of the Siege of Sevastopol, Crimean Peninsula. German troops capture Yalta. MTO - Libya: Day 214 of 256 of the Siege of Tobruk. MTO: Royal Navy Surface Force K sailing from Malta annihilates an Italian convoy of seven supply ships and sinks two escorting destroyers. East Africa: Day 518 of 537 of Italy's East African campaign in the lands south of Egypt. CBI - China: Day 1,587 of 2,987 of the 2nd Sino-Japanese War. ETO - France: US 8th Air Force heavy bombers conduct a low level attack on a U-boat base at St Nazaire. Russian Front - North: Day 428 of 872 of the Siege of Leningrad. Russian Front - North: Day 189 of 658 of the Siege of the Kholm Pocket, USSR lays siege to the Kholm Pocket but the Germans hold out for a about a year and a half. Russian Front - South: Day 135 of 150 of Germany's CASE BLUE, the failed offensive to take the Caucasus oil fields. Russian Front - South: Day 79 of 165 of the Battle of Stalingrad, bloodiest battle in human history. MTO - Egypt: Day 18 of 20 of the 2nd Battle of El Alamein. Sidi Barani is captured by British 8th Army. MTO - North Africa: Day 2 of 9 of Operation TORCH, the invasion of Morocco and Algeria. Naval battles off Oran and Casablanca result in three Vichy French destroyers sunk. US troops advance on both sides of Oran, taking 2,000 Vichy French prisoners after stiff resistance. US 12th Air Force (flying Spitfires) turns back a motorized column of the Vichy French Foreign Legion in Algeria. MTO - Tunisia: German paratroopers are landed in Tunisia without opposition from the Vichy French. CBI - China: Day 1,952 of 2,987 of the 2nd Sino-Japanese War. PTO - Alaska: Day 156 of 435 of the Battle of Kiska, Aleutian Islands. The US and Canada will defeat the Japanese invaders. PTO - Malaya: Day 264 of 357 of the Battle of Timor Island, a long guerrilla war ending in Japanese victory. PTO - New Guinea: Day 112 of 119 of the Battle of the Kokoda Track. The Australians continue pushing back the Japanese troops. PTO - Solomon Islands: Day 95 of 187 of the Battle of Guadalcanal. Russian Front - North: Day 793 of 872 of the Siege of Leningrad. Russian Front - North: Day 554 of 658 of the Siege of the Kholm Pocket. USSR lays siege to the Kholm Pocket but the Germans hold out for a about a year and a half. Russian Front - South: Day 78 of 122 of the Battle of the Lower Dnieper River, USSR. Russian Front - South: Day 7 of 10 of the 2nd Battle of Kiev, Ukraine. CBI - China: Day 2,317 of 2,987 of the 2nd Sino-Japanese War. Day 8 of 49 of the Battle of West Changde. PTO - New Guinea: Day 52 of 219 of the Battle of Shaggy Ridge. PTO - New Guinea: Day 49 of 162 of the Battle of the Huon Peninsula. PTO - New Guinea: Day 8 of 10 of the Bombing of Rabaul, a joint US, Australian and New Zealand carrier and land-based attack on the Japanese cruiser force at the naval base at New Britain. PTO - Solomon Islands: Day 9 of 295 of the Battle of the Bougainville Islands. USA: Total American war casualties are now reported to have passed the 500,000 mark. ETO - France: Day 101 of 284 of the Battle of Brittany. ETO - France: Day 56 of 236 of the Siege of Dunkirk. ETO - Netherlands: The last Germans on Walcheren Island surrender. German troops evacuate the Moerdijk bridgehead across the Meuse river. ETO - Germany: Day 52 of 145 of the Battle of Hürtgen Forest. ETO - France: US 8th Air Force sends 1,309 heavy bombers and 738 fighters hit front line strongpoints and tactical target areas in the Metz and Thionville. Russian Front - Finland: Day 56 of 223 of the Lapland War. Finland and Russia have joined forces to kick the Germans out of Finland's most northern province. Russian Front - Center: Day 26 of 206 of the Battle of the Courland Pocket in Latvia. Russian Front - Center: Day 19 of 99 of the Siege of Memel, a border town of Lithuania and East Prussia. Russian Front - Center: Day 57 of 72 of the Battle into East Prussia and northern Poland. Russian Front - South: Day 12 of 108 of the Battle of Budapest, Hungary. Russian Front - South: Day 57 of 72 of the Battle of Belgrade, Yugoslavia. CBI - Burma: Day 223 of 302 of the Chinese Salween Offensive in Burma. CBI - China: Day 2,683 of 2,987 of the 2nd Sino-Japanese War. Day 207 of 259 of Japan's Operation ICHI-GO. PTO - New Guinea: Day 202 of 481 of the Battle of Western New Guinea. PTO - Palau Islands: Day 56 of 74 of the Battle of Peleliu (Operation STALEMATE II). PTO - Philippines: Day 21 of 299 of the 2nd Battle of the Philippines, aka the Liberation of the Philippines or the Philippines Campaign. PTO - Philippines: Day 21 of 73 of the Battle of Leyte. During the German occupation of Rome from 1942-1944, Irishman Monsignor Hugh O'Flaherty ran an escape organization for Allied POWs and civilians, including Jews, safe within the Vatican state.